Recently the Pawtucket Red Sox, the Triple-A field team for the Boston club, have come forward yet again with a proposal for taxpayers to finance the construction of a new stadium. Two years ago the team was arguing for the same thing but at a site located in Providence. Here we are going to syndicate the analysis of longtime Green Greg Gerritt, who was deeply involved in the opposition two years ago. If you take a good hard look at where the RI economy is going, we are in a very low growth phase. The conditions for rapid economic growth do not exist in Rhode Island, and cutting taxes for the rich and dismantling environmental and health regulations are not going to get us there. Given the low growth conditions, the only way to improve the well being of most Rhode Islanders is to create a healthy and resilient infrastructure designed specifically to help our communities respond properly to the climate change, food insecurity, and rising inequality that are currently haunting us. The people of RI in this case are given a very contrasting set of choices. 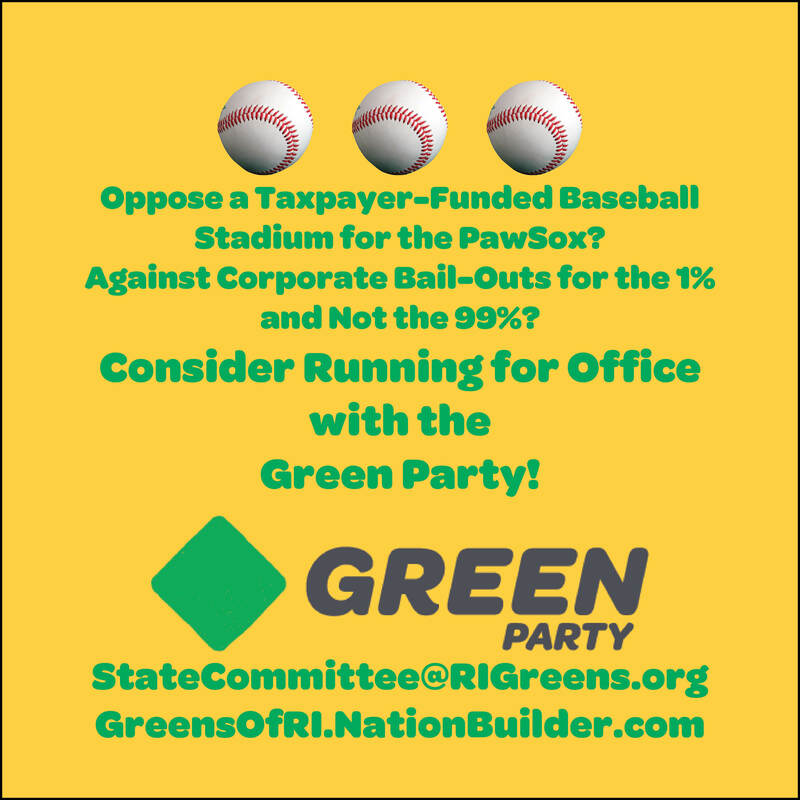 On one hand give $120 million of the public’s money to some people to build a baseball stadium that would contribute mightily to increasing the cost of managing storm water, or investing the public’s money in Green Infrastructure that increases community resilience and safety, helps us cope with climate change, and creates more new jobs than a baseball stadium moving jobs that are now a mere 5 miles away. Of course these are not our only choices, but if the people of RI are investing in construction, it is pretty clear which one benefits us more. For years RI leadership has been touting the I-195 lands as the economic savior of Providence with all the potential of the “Knowledge District approach to economic development”. How in hell could they acquiesce to the use of these lands for a baseball stadium and its attendant parking lots? I have a long track record of stating that the medical industrial economy is not a good foundation upon which to build an economy. Betting your economy on the leading cause of bankruptcy in the country seems a strange strategy and there is no doubt the medical industrial complex has played a big role in growing inequality in the American economy. My warnings about the expectations of growth from the medical industrial economy have been ignored and the bandwagon for high tech medicine continued. But now we have a proposal to throw that all away for a baseball stadium despite overwhelming evidence that sports arenas do not really help downtowns and create few family supporting jobs. If the politicians go for the stadium, I almost hate to say it, it will prove beyond a shadow of a doubt that even politicians have realized that the medical industrial economy is not going to do what they have been saying it would do all these years and it is time to give up. But I will say that giving up on the medical industrial economy can be done without doing anything as astronomically dumb as building a baseball stadium and parking lots. I sure hope the RI politicians will hold out for a better use of the I-195 lands than to sign it away to the lords of baseball. I was horrified to read in the May 20 Providence Journal article entitled “Mattiello: Next pitch is the state’s” that the Speaker of the Rhode Island House is still trying to make a deal over the baseball stadium. Obviously he is not listening to the public. I attended the public forum at Hope HS on May 18 and other than someone who thought they might get a construction job for a few months building the stadium, not one person thought it was a good idea to provide any state or city tax subsidy to a bunch of millionaires trying to extort money from the public by threatening to leave. I am a baseball fan, as were most of the others at the hearing. But none of us thought giving away the public’s money was a good idea, and many thought the site was very flawed. For a Speaker laser focused on economic development, Representative Mattiello is missing the boat on this too. There is no financial gain for the people from this by any measure, giving a public subsidy to very wealthy people will only serve to increase inequality, and as Picketty demonstrated recently, growing inequality harms economies. Economic development in the 21st Century is a bottom up, not a top down, proposition. That Rhode Island continues to think top down, and gives sweetheart deals to inside players, is why our economy does not work very well. I am writing about several different, but connected, topics relating to the Rhode Island economy. The trigger for this letter is the effort by the new owners to move the Pawtucket Red Sox to the Providence waterfront. Personally I think it is a very bad idea, and that seems to be the statewide consensus based on letters to the paper and comments sent to the Summit neighborhood email list as well as conversations I have had. My request on this is that there be public hearings on this before anything happens. My guess is that if there are public hearings the outcry will be overwhelming and no board that had any public consciousness would give a permit. Then there is the issue of the richest men in the state asking for a subsidy for their hobby. Please publicly state that before anything happens you would like to see a full public airing of this topic. I have talked to various agencies in RI and the CRMC, the I-195 Commission, and the City of Providence all agreed that public hearings seemed a good thing, though all were constrained by the lack of any formal proposal in front of them. You do not need to be so constrained, and calling for a public airing at a time when another politician has admitted corruption around real estate development, would feed into a move towards better ethics legislation. A full public discussion sooner rather than later helps us all figure this out, one way or the other, at an earlier time with less overall cost. 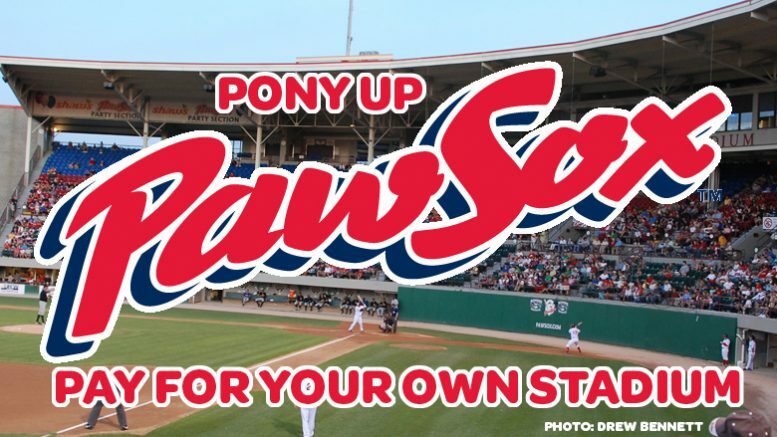 Given the recent record of the political leadership of Rhode Island on major economic development projects, and Rhode Islanders well founded fear and dislike of the inside baseball politics of economic development, the proposal to move the Paw Sox just seems so Rhode Island. You and I are both familiar with the disaster of 38 Studios, a disaster that likely would not have happened if the decisions had been made after public hearings. You may not be as familiar with the public discussion of the proposed container port at Quonset. I was a stakeholder and participated in every public meeting from a seat at the table. If the governor and the legislature had had their way, 38 Studios would look like a child sized disaster compared to the billion dollar price tag of a port that would have opened as the recession hit. It was the public outcry and resolve that finally allowed the outing of the con men who had conned the leaders of the State with visions of dollar signs dancing in their heads. I will come back to this last point shortly but first I want to flag the issue of what is the appropriate use of the land in the knowledge district given our current placing of meds and eds at the heart of our economic development strategy. The evidence is pretty clear that baseball stadiums are not big economy boosters. 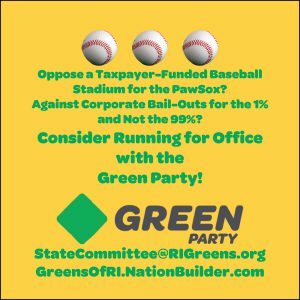 Building a baseball stadium on the waterfront, in addition to depriving the public of waterfront access (which in and of itself is a major issue with large financial implications for the taxpayers) brings into question the entire meds and eds strategy as it relates to the use of the I-195 land. Devoting that much land to baseball and parking, especially on the waterfront, is probably not a smart move. Baseball creates few well paying jobs, few full time jobs. I have serious problems with the strategy of placing meds and eds at the heart of economic development. Both industries are at about the limits of what the American public can pay for, and are leading causes of bankruptcies and stunted asset acquisition, but that is a discussion for another day. The question today is does the baseball stadium fit in with the best way to use the land to enhance the city? If we are betting on a Knowledge District, then this is not the way to do it. Beyond the immediate question of a baseball stadium, economic development strategy in RI needs to be better adapted to the changing world economy, but not in the ways most folks talk about. What Rhode Island needs to adapt to is slowing growth rates globally and an understanding that our growth rate is going to be generally below average. Our growth rate will be below average not because of our business climate (though the inside baseball audacity of Mr. Skeffinton astounds, and these types of subsidies do not reflect well in the rankings) but primarily because most of the economic growth that does occur globally and in the US will end up in the few places that are global financial centers, the places that are rapidly industrializing low wage countries with rural populations to urbanize, and places with short lived natural resource booms. Rhode Island has none of these advantages and our growth rate is therefore going to be slightly below the slowing global and US growth rates even if we were the perfect business climate groupie. Many people question the idea that growth is slowing, and politicians are extremely reluctant to even think about it, but more and more reputable experts are recognizing it. Even the global consulting firm McKinsey sent out a recent report noting that it is going to be very difficult to maintain current growth rates in the medium to long term due to changes in the economy and in planetary ecosystems. Planning for a slower growth rate, and understanding how to achieve maximum prosperity with slow growth, does not appear to be on the agenda, but it ought to be along with Full Cost Accounting. The current political climate calls for a “good business climate” despite the fact that business climates are remarkably persistent over time despite years of political rhetoric and legislative action, that business climates have very little overall effect on state economies (less than 5% of the growth rate is attributable to tax rates and transparency of bureaucracies) , and that it is clear that a good business climate creates greater inequality and that greater inequality is one of the things that hold back economies. Again a much larger discussion but one I would be willing to have with you and your advisers at your convenience. In summation, I do not know if we can convince the new ownership of the Triple A Red Sox to return to Pawtucket, but we can make sure that any attempt to move to Providence gets a full public hearing. You should insist on the public hearing and then turn attention to what all of this reveals about the new world of economic development in post industrial Rhode Island.